Quality Livestock Concrete Waterers | Bohlmann Inc.
With over 20 different models of concrete livestock waterers that range in capacity from 5 to 140 gallons Bohlmann Quality Products provides accommodations for any sized livestock operation. All models come standard with a choice of electric or manual constant flow, with sloped side walls to offer extra protection from the elements. Our waterers are optimized for summer cooling and winter heating through the use of polyurethane insulation, which provides long lasting durability and consistency. The precast concrete hull of Bohlmann cattle waterers eliminates rusting of troughs and walls, and is reinforced with a steel frame and, in larger models, wire mesh. Our cattle waterers are well insulated to contain ground heat within the waterer; more than two (2) inches of polyurethane insulation provide an R-value rating of 12, maximizing heating economy in the winter and cool water in the summer. The troughs are sealed with a two-part epoxy coating for added protection from salts and minerals while creating a smoother finish surface for easier cleaning. 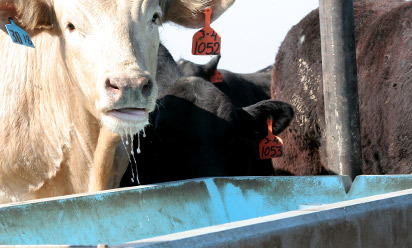 Most models of Bohlmann cattle waterers also offer oversized drains, which are flush mounted with bottom of the trough for an increased level of ease during cleanout. All models come standard with electric or manual constant flow. Manual constant flow can be turned on to circulate the water and help prevent freezing. The sloping side walls of Bohlmann cattle waterers offers extended protection against freezing. Our Dairy Waterers are perfect for small to medium sized herds, utilizing its design to fit most any space while providing drinking area for the herd. Our Small Capacity Waterers deliver the same lasting strength of our dairy waterers, with the flexibility in size to be placed optimally for smaller herds. Bohlmann Feedlot Waterers, our largest livestock waterer models, are built to stand the test of elements, herd size, and time.